We’ve seen reports of what reforms have done to Russian military medicine, but what follows is the first comprehensive review of its condition. Cuts and reorganizations are on Defense Minister Serdyukov, but, to be fair, infrastructure deficiencies long predated him. Military medicine is an area where he deserves some criticism. But it’s unclear why it was the weak point chosen for an attack on his management, or why Valentina Matviyenko was the one to deliver it. In any event, with the most recent chief of military medicine now in prison awaiting trial, it’s easy to conclude there are some pretty significant systemic problems. Nezavisimaya gazeta reported Monday that a Federation Council panel on the social defense of servicemen has, not surprisingly, given military medicine an unsatisfactory evaluation. It came despite a positive self-assessment from the Main Military-Medical Directorate (GVMU). 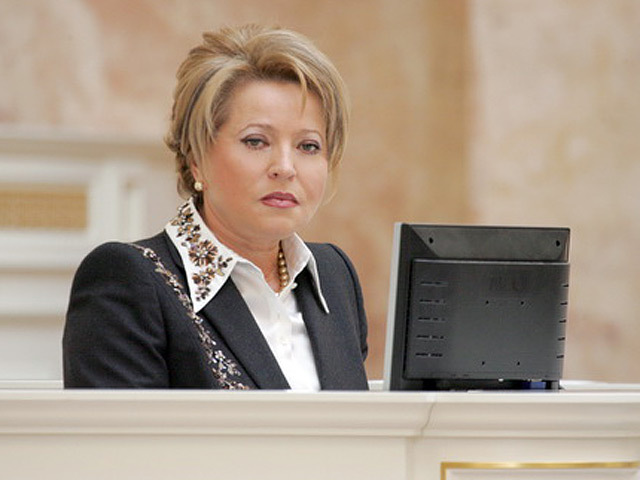 NG’s Sergey Konovalov said Federation Council Speaker Valentina Matviyenko, who conducted the session, repeated everything critical about military medicine heard recently from social organizations, parties, and the media. Konovalov notes for readers that Kalmykov’s only been at his temporary post for three weeks. He’s taking the spot of General-Major Aleksandr Belevitin who’s in jail awaiting trial on corruption charges as well for an alleged attempt to arrange the murder of a witness. Matviyenko expressed concern about cutting officers and replacing them with civilian workers in military medicine. An Audit Chamber auditor told the FC panel more than 1,000 Defense Ministry medical units and departments (38 percent of the total) occupy buildings and spaces which don’t meet technical and sanitary norms. And 735 medical facilities (27 percent) need capital repair. New medical equipment the Defense Ministry languishes because there aren’t medical buildings and centers in which it’s possible to treat patients. 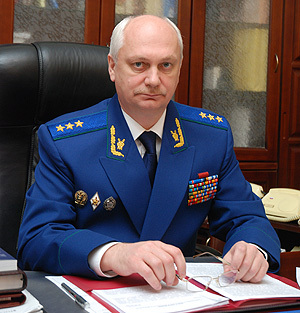 First Deputy GVP Andrey Nikulishchin is afraid unfinished construction and other military medical problems are connected with corruption. He suggests that military medical units get only 20-50 percent of the medicines they require. He blames elevated prices and “nontransparent” trade in them (presumably in addition to corruption). Here’s what looks like a case where the beating death of a conscript is being passed off as another suicide in the ranks. We addressed this here, and the tragic Ayderkhanov case broke into the news just 11 days later. This sad story deserved attention sooner than your author was able to give it. Thursday Newsru.com reported Ayderkhanov’s body has been exhumed for additional medical examination to determine the cause and circumstances of his death. Official examiners as well as one independent expert, Aleksandr Vlasov, will take part in the process which, according to RIA Novosti, should take two weeks. Newsru recapped the basic facts. 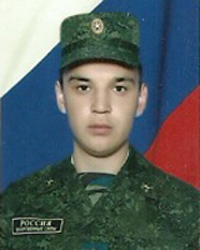 On August 31, the 20-year-old Ayderkhanov went missing from V / Ch 55062, part of the Yelan garrison, located in Poroshino, Chelyabinsk Oblast. His body was found hanging from a tree in nearby woods on September 3. 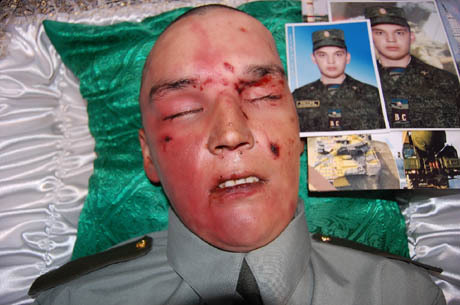 The military authorities were quick to label this an obvious suicide, but his relatives were suspicious about injuries all over Ayderkhanov’s body. He had teeth knocked out, a broken leg, a missing eye, a knife wound in his chest, and burns, bruises, and abrasions. The Yelan garrison’s military prosecutor opened an Article 110 “Incitement to Suicide” investigation, but just as quickly announced there were no facts indicating violence or the “violation of the regulations on mutual relations” [i.e. abuse] against Ayderkhanov. The prosecutor concluded the soldier was simply depressed about the death of his mother last winter. The Main Military Prosecutor stated categorically there was no evidence of a beating, and any injuries on Ayderkhanov’s body were from banging against the tree on which he hung himself. The GVP categorically rejected the idea of exhuming and examining the body again. According to Radio Svoboda, after the GVP proved no help, Chelyabinsk’s human rights ombudsman approached Aleksandr Vlasov. Vlasov has stated his professional opinion that Ayderkhanov was struck at least 18 times while he was still alive. An update on the Igor Sulim case . . . on Tuesday, Moskovskiy komsomolets’ Olga Bozhyeva reported there may finally be some pressure on the alleged extortionists. Colonel Kovalskiy and one Captain Artemyev decided (in fine Russian tradition) to go the hospital to avoid arrest, but a former 4th squadron chief of staff and Kovalskiy relative, Mikhail Zakurdayev was arrested on July 30. Bozhyeva wrote about related crimes at Lipetsk including forgery and extortion from civilian workers receiving premiums to the tune of 10 million rubles. She reported that, despite the Defense Ministry’s promise to check all units, systemic extortion of premium pay was only found in Lipetsk, Sevastopol, Syzran, and Michurinsk. The case at the Syzran generated some media attention starting on July 29. The press reported the chief of the helicopter pilot training center, Colonel Nikolay Yartsev, and a former training regiment commander have allegedly been “taxing” pilots five percent of their premium pay, taking a total of four million rubles from 43 officers last year. The Saratov garrison commander has opened a criminal case against them. Bozhyeva ends with an excerpt from Sulim’s blog where he says officers are quizzed several times a day on the most obscure military topics. Failing the tests justifies not paying their premium pay. According to RIA Novosti, on Wednesday, Sergey Fridinskiy announced that unnamed VVS Glavkomat officers have been held to account for violating the rights of Lipetsk pilots facing extortion from their own commanders. The Main Military Prosecutor apparently responded to queries from Duma deputies interceding on behalf of Senior Lieutenant Sulim. Fridinskiy indicated his prosecutors checked on Sulim’s complaint that his rights were violated during the initial [Air Forces] investigation. The GVP found that, in the investigation, no active steps were taken, and conditions were created for continued illegal activity by dishonest officers. They obstructed the investigation, and pressured officers prepared to cooperate with investigators. According to RIA Novosti, Sulim’s main antagonists, Colonels Kovalskiy and Sidorenko, were removed from duty, but continued to have regular, unfettered access to the base. But the pilots and navigators who gave evidence were removed from flight duty and given menial duties. Several times the command’s given Sulim tasks without informing him to provide the basis for reprimands for not fulfilling assigned duties. The Duma deputies who went to Fridinskiy think the Lipetsk command’s dragging out the case and using “administrative resources” to pressure those who spoke out. The deputies believe the Tambov garrison military prosecutor isn’t interested in closing the case, and to them, this means higher-ranking officials will have to be made accountable.